Choosing the right AMS for your team is likely the most important purchase decision you'll make. Learn the 5 steps to follow to ensure you find the right system. Seventy-four percent of life and health insurance agencies are using either a generic CRM or an industry-specific agency management system (AMS) to run their operations. Today, it's no longer IF you're adopting technology, it's WHEN and WHICH one. How can you know which system will be best for your agency? It's a big decision, and it requires following the necessary steps. In this webinar, we cover the 5 steps to selecting the right AMS for your agency. We'll discuss everything from identifying internal pain points to making the transition easier for your team. 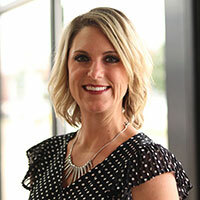 Kellie Robbins is the Key Account Sales Representative at AgencyBloc, so she has extensive experience in walking through the ins and outs of agency management systems (AMS) with life and health insurance agencies. In this webinar, she'll share her expertise in the selection process, vendor research, and the "next steps" after the sale.